Winter in Boston means fighting the desire to stay inside to cook, watch movies, and snuggle up under a warm blanket on the couch. Last weekend I had two great events to motivate me to get dressed up and head into the city. 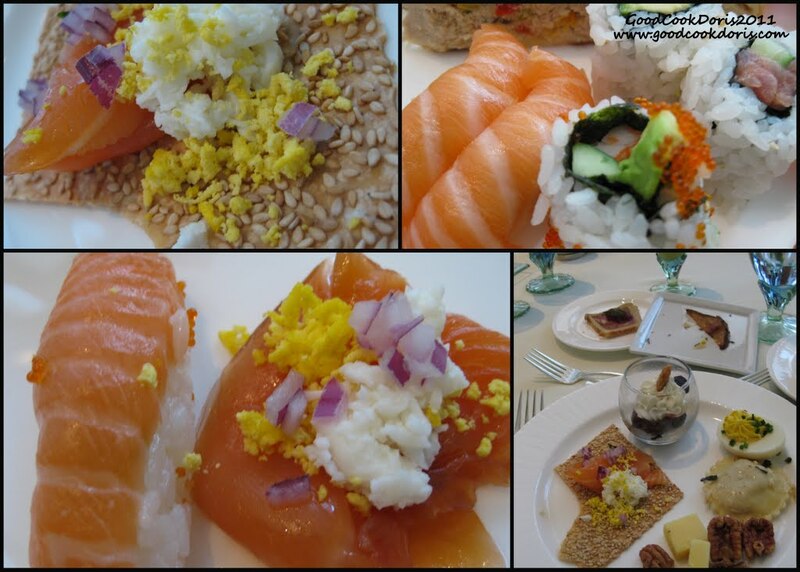 Both events were at fabulous Boston hotels and filled with delicious food and delightful company! My extravagant winter weekend started on Saturday at the 5th annual Gamma Phi Beta Boston Alumnae Chapter High Tea. 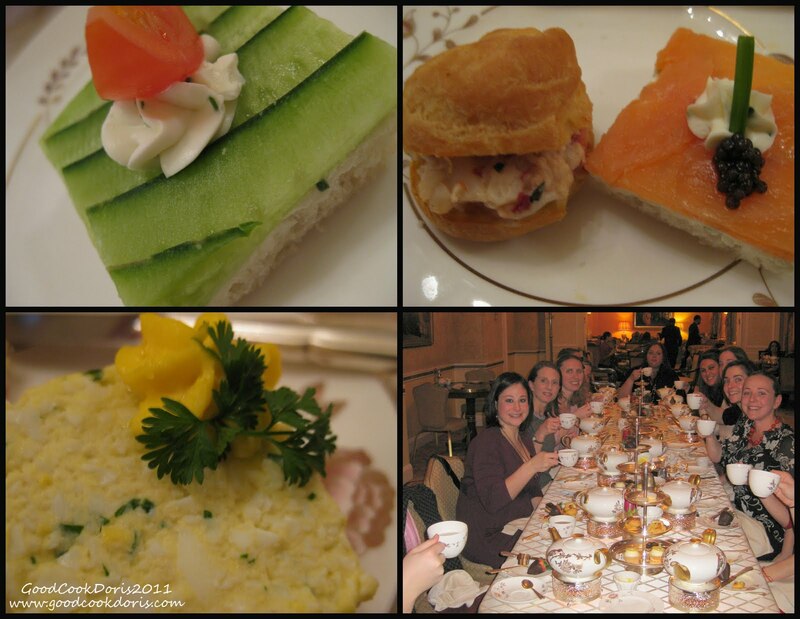 A group of alumnae met at the Taj Boston for an afternoon of mini sandwiches, rich pastries, and great conversation. 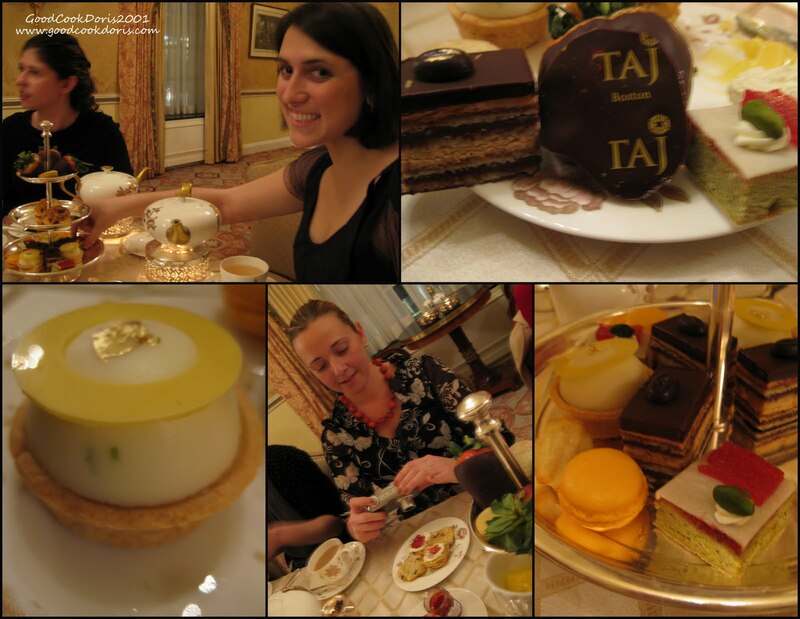 Our group loves tea at the Taj. The service staff is fantastic and we always have a wonderful experience. The Taj Royale is a manageable amount of treats (if you didn’t eat lunch!). My absolute favorite is always the egg salad sandwich. Thankfully you don’t have to share anything as they give you one of each item. No worrying that you won’t get your favorite! While the sandwiches are delicious and paired well with my vanilla earl grey, it’s the pastries that really steal the show. They are decadent and some are topped with gold leaf. The lemon curd is rich, tart, and creamy and it was hard to put down. On top of cherry scones it was even better! Renee could make a meal of scones, clotted cream, and strawberry jam alone. She talks about them for days before tea. You can see her setting up her photo shoot below. Some of the ladies at the table didn’t polish off their pastries like me….and we took home delicious packages for a late night snack! After an indulgent tea, I went to bed without dinner. The next morning I woke up excited for my second adventure of the weekend. I decided that a fabulous brunch deserved an equally fabulous outfit and got myself ready to head downtown. I skipped breakfast to leave more room for total food overload. My destination was The Langham Hotel for the City Brunch in Café Fleuri. 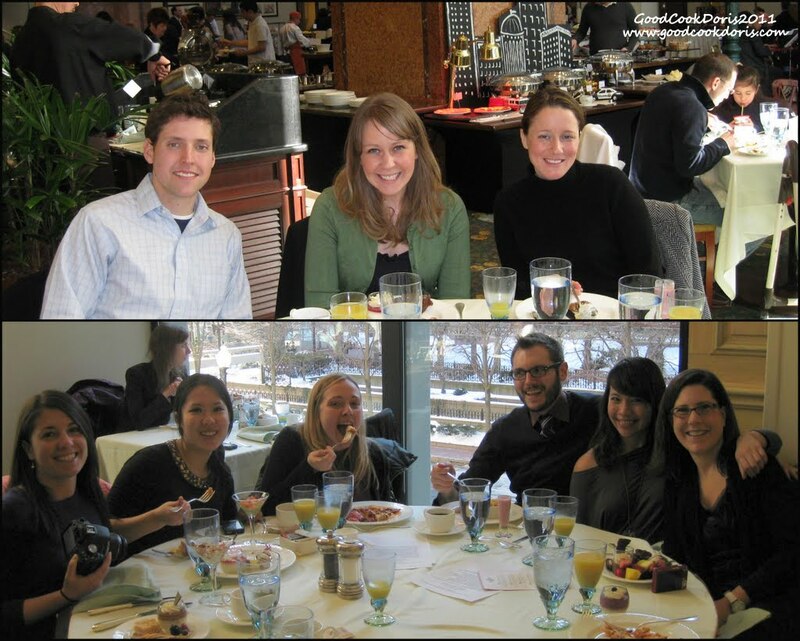 I met up with 14 fellow food lovers, the Boston Brunchers to experience the extravagant Sunday brunch. Thanks to the Langham, my brunch was complementary. I did splurge on a delicious grapefruit mimosa ($9) and made sure to leave a generous tip for our fantastic server, who asked us why we weren’t live blogging through the meal. Our answer? We were too focused on food to think about blogging or tweeting while eating! I was not required to ‘review’ brunch and the opinions below are my honest thoughts about my meal. One of the other unique offerings at brunch were the hot out of the fryer beignets. After one bite I can see why they pass these out one at a time. If they were on the buffet everyone would overdose on them! The sugary exterior enclosed a light, airy, steamy interior. I savored each bite with a cup of hot coffee making it last as long as possible. I think I finished the meal having taken at least five trips to the buffet. Some trips resulted in just one or two items and I ended up not finishing all of my dessert. The chocolate croissant bread pudding with caramel sauce was a decadent end to the meal, but it was almost too rich for the amount of food I had already consumed. More fun than the food was the company! The Boston Blogger scene is filled with friendly, unique, creative, and fun people! No matter who ends up at your table, the conversation is lively and enjoyable. It was great brunching with everyone! After a lavish brunch most people would head straight for the couch and spend the afternoon in a supine position. When it comes to food adventures, I am not like most people. I don’t regularly have the car in the city and wanted to take advantage of it. Renee nicely agreed (well, I was her ride home) to join me for a trip over to Central Bottle Wine and Provisions and Flour Bakery and Café. I love the Blue Room (same owners as Central Bottle) and chat with Central Bottle on twitter, so I knew we were in for a great experience. Of course you can’t visit a wine & cheese shop and not taste the cheese. There was house marinated goat cheese, aged gouda, creamy cow’s milk cheese and more. 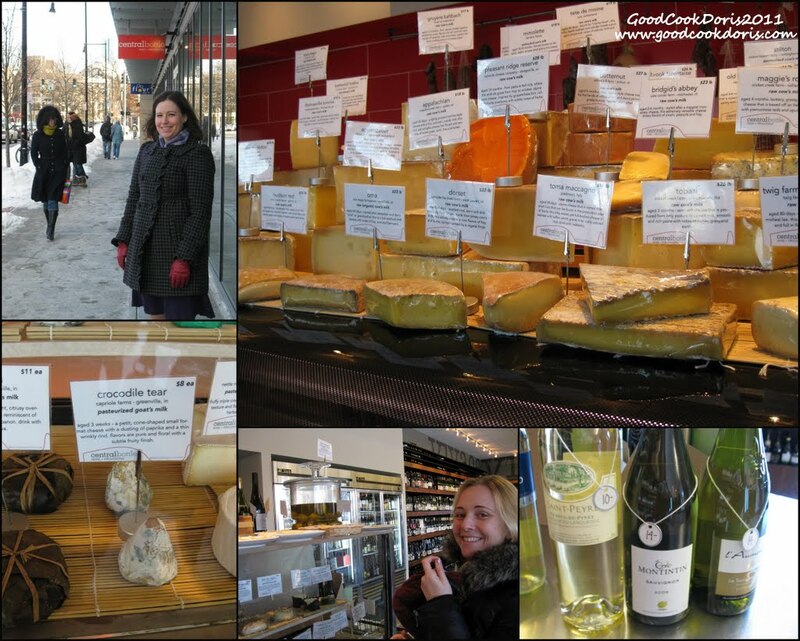 I chose a tangy little Bijou Goat Cheese from Vermont and Renee took home a wedge of mimolette and Cabot clothbound cheddar. It was impossible to leave without picking up wine also. 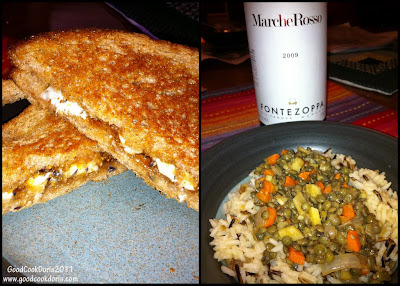 I spotted a red that looked interesting – Marche Rosso Fontezoppa. I chose it because I know that I like the grapes in the blend (50% sangiovese, 40% cabernet, 10% merlot). Another bonus, it was $11! When it came time to pick white, I had no idea what I wanted. Thankfully I was able to explain my likes/dislikes to the friendly staff who presented me with four different options in my desired price range. I haven’t opened that bottle yet, so I’ll save it for another post. I paired the red with a variety of dishes and it was dry, coated my tongue (which I love), and kept me going back for more. I paired it with a grilled goat cheese, fig, and lavender sandwich and a hearty bowl of lentils with a garlicky balsamic vinaigrette.The flavor paired well with the bold flavors in the food and was perfect for a cold wintery day. And of course I should mention what delicious treats I got at Flour! I was so full from brunch it was hard to decide. Since the hubby didn't enjoy either of the meals (he did get the leftover tea pastries), I picked something I knew he would like. I took home two beautiful cornmeal lime cookies. They were the perfect combination of sweet and tart. The lime glaze on top was amazing - I need to try to make that at home! Now you can see why Healthy Snacks Wednesdays are so important! When you know you have a lot of weekend eating on the schedule you have to be more healthy during the week. Don't forget to enter the giveaway for two vouchers for your choice of Veggie Patch products. You can enter through Tuesday night. What fun food adventures do you have planned for this weekend? I hope they are delicious! Those pastries from the Taj look fantastic. I'm also a big fan of central bottle but I don't go there nearly enough. ....but what did you get a Flour??? :) Have you tried their homemade Oreos? Mmmm (falling into food coma just thinking about it...) I've only ever been to the one in the South End, but I'm assuming they sell the same things at both. Your goat cheese/fig sandwich looks amazing. That tea at the Taj looks so elegant, and even the takeout box is beautiful. I had a great time seeing you at brunch. I love how we all gravitated to different items. AND... you were totally in my neighborhood. Glad you enjoyed your visit to Central Bottle and Flour, and, yes, what did you get at Flour? It looks like you had a blast. What a wonderful memory that will be for you. This post made me smile all over again! I would love to do tea at the taj sometime! glad you and renee took advantage of the day in Boston! What a fantastic weekend you had! Renee's face in the Langham brunch photo is priceless! Now that is a fantastic foodie weekend, very jealous! Great wrap-up. I've yet to try the brunch since the Taj bunch took over, I always loved it there when it was the Ritz, however. I've always wondered about tea at the Taj, looks good and also looks like you had a lot of fun! What a delicious little weekend! What a great food weekend! I will try to join you guys for tea at the Taj next year! After brunch, I'm one of those people that went home and immediately took a nap. Kudos to you for powering through and eating more! And how thoughtful of you to treat hubby too :) Cornmeal lime cookies sound pretty interesting. Now THAT is a fantastic weekend. Not much eating planned today - other than a slice of a 5 yr olds birthday cake! Tomorrow I start my cooking for Monday night's dinner with the neighbors! I am bookmarking this site for the next time the BH and I head to Beantown! I can't wait to try Flour! Your photos look great and I bet the food was excellent. Thank you for this post.